Carpet shop in super edited colours? I may be quite wrong but clever effect! Have ever so slightly exaggerated colour on picmonkey, but the original is almost as bright! 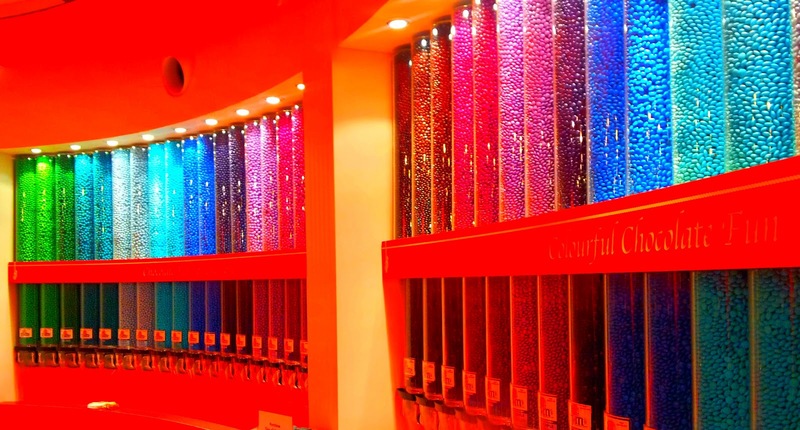 And it is in M&Ms world in London, they have 22 different colours for pic'n'mix - it's amazing! Lovely colours. Who knew carpet could be so bright? Fab colours and very excited at seeing all that chocolate! I had no idea there was even such a place as M&Ms world! I must go! Cool pic! Love the colours and the way the columns sweep across the photo. And all that chocolate? Yum! Silent Sunday & a loud picture. Love it! Oh my God, M&Ms heaven! Beautiful picture - at the fact it says chocolate across it - even better! Oh wow what fantastic colours! Jelly beans?m&ms?